At the Goals Foundation we feel every child has the right to enjoy the fun of playing sports, the joy of teamwork and experience of being on a field or court. Our programs and partnerships with other youth serving organizations are designed to meet the needs of under-served and at-risk youth, as well as youth with special needs. Rising Stars is a free soccer program for children and adults with cognitive and/or physical disabilities that takes them off the sidelines and puts them onto the field where they get to taste the joy of team experience. Ages range from 4 years old to adult, and players are matched based on cognitive ability and skill. The unique design of Rising Stars allows players to achieve personal success using Buddies, volunteers who translate each session to the level and ability of their players, ensuring each player is successful on the field. The Goals Foundation purchases, collects and distributes new and gently used sports equipment to underserved kids, teams and clubs in need. The Passback Program allows us to enrich lives through sports and provide desperately needed equipment to those who need it most. Most recently, Goals Foundation collected equipment for the many youth and youth organizations impacted by the Nor Cal Fires. Joe Belluzzo Housed at FC Soccer in Santa Rosa,, used outdoor soccer cleats are available to youth in need at no cost. Where possible, we ask that players bring in a used but good condition pair of cleats to trade up for a new size. 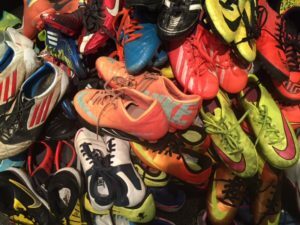 The shoe bank runs on donated cleats from the community. Donated shoes are welcome always.